All eyes are on U.S. shale as we head into 2018, with a growing number of analysts worrying that shale will spoil the oil price rally. Estimates of supply growth varying quite a bit, but directionally, everyone is in agreement: Supply is set to surge. However, there are some cracks in the shale complex that might not necessarily mean much in the short-term, but raises some questions about the long-term durability of shale output. 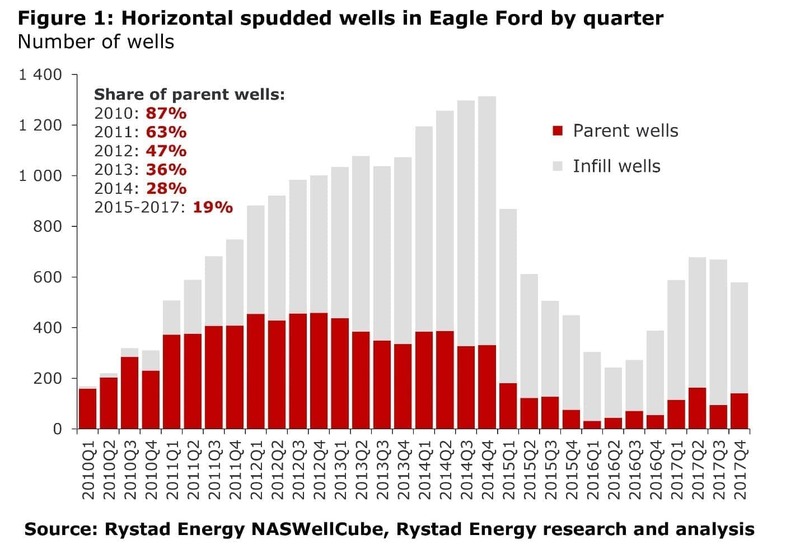 According to Rystad Energy, there is empirical evidence that points to falling production in the Eagle Ford from some of the recently drilled shale wells. Everyone knows that shale wells enjoy an initial burst of output that is quickly followed by a precipitous decline within a few months. A driller must constantly drill new wells in order to grow production. The shale industry has boasted of higher initial production rates from their shale wells over the last few years, which is seemingly evidence of improved drilling techniques, such as longer laterals, the increased use of frac sand and fluids, etc. In short, the shale industry has been able to coax more oil and gas out of a shale well in the first few months of a well coming online than it used to. However, Rystad Energy argues that there is some evidence that suggests those higher initial production (IP) rates do not necessarily translate into larger gains in the total volume of oil and gas that is ultimately recovered. A sample of wells in the Eagle Ford showed steadily higher IPs in recent years, but they also exhibited steeper and steeper decline rates. Part of the reason is that the shale industry has had to drill more wells that are closer together. That has typically been described as an innovation that leads to more recovery. Indeed, the initial production rates from the average well in several counties in South Texas have increased markedly year after year. The first few horizontal wells in a section are classified as “parent” wells, with follow-up completions described as “infill” wells. In the Eagle Ford, according to Rystad Energy, the makeup of spudded wells has shifted dramatically towards infill wells as many areas of the basin have been worked over. In 2010, Rystad says, “up to 90 percent of activity corresponded to new pad development. This share declined rapidly over time, falling to 15-20 percent in 2015-2017.” As such, the rebound in output from the Eagle Ford over the past year has mostly come from infill drilling. 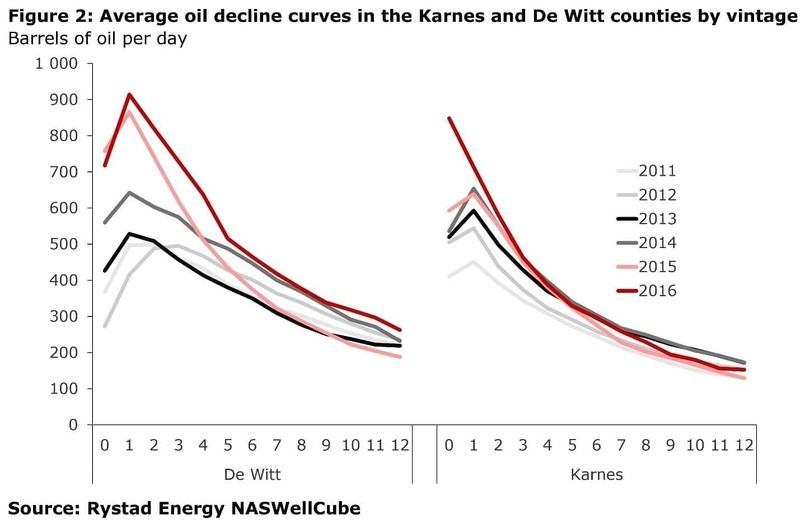 Rystad looked at two counties in particular – Karnes and De Witt – where infill drilling was especially dominant. In these two counties, the IP rates increased sharply between 2011 and 2016. In 2011, the IP for a new well in De Witt County peaked at about 500 barrels per day (bpd), a figure that nearly doubled to 900 bpd by 2016. Based on that, it appears that the shale industry has become dramatically more efficient, and it suggests that if such breakthroughs can be replicated, U.S. oil production can continue to climb. But the huge gains fizzled after the first few months. Rystad concludes that when taking into account the first full year of production, not just the first month or two, the 2016 wells only resulted in an additional 40,000 barrels of oil compared to the 2011 wells. By the second year of production, the newer wells do not outperform the older ones at all. In other words, the 2016 wells had a stronger burst of output right away, but that was offset by steeper declines as the year wore on. “By any means, this cannot be classified as a significant uplift for the well ultimate recovery when considering a 100 percent increase in the peak production rate,” Rystad concludes. By 2016, Marathon came back and drilled more wells armed with new knowledge and drilling techniques. It drilled longer laterals and used much more frac fluid. Only four of the completions outperformed the older ones, and on average, the IP peaked at 32,500 boe per month (less than the older average) and declined to just 8,000 boe per month in seven months as opposed to the 13 months the first time around. In other words, Marathon drilled more aggressively in 2016 and arguably came up with less impressive results. This is not necessarily indicative of the entire shale industry by any means, but it does highlight some of the problems with relying too much on the initial production metric. Yes, IPs have climbed over time, but some of these wells are petering out faster than older wells. In a way, this trend is understandable since it took place in an area that had already been drilled. But as U.S. shale basins mature, the industry will need to increasingly rely on similarly well-developed areas. Really nothing new here. More closely spaced wells tend to yield a higher initial production rate for a field, but smaller recoveries per well with a steeper field wide decline rate. Rystad estimated that 2016 had the highest decline rate of the past 25 years. It's likely to get worse, too, as the recent deep spending cuts steepen the decline curve for the next two years. Furthermore, we can expect a long-term structural increase in the decline rate, simply because—in the absence of many new fields be­ing developed—the average age of the produc­ing ones is now trending upwards. In 2017, we assessed the decline rate at 9+%, equating to about 8.8m b/d. That's five times greater than the demand increment for 2017. Not all oils are created equal, some are are cheaper to extract, some are expensive, some are extremely expensive to extract; some are are heavy, some are light, some are super sweet light therefore they have very different values in their refinery process. To understand the hype of shale oil growth, first, you better to find out which category shale oil belongs to. Learn from real geologists and field engineers, not from newspaper hacks and copyists. Then there is the question about the persistent negative free cash flow experienced by the fracking industry in every year of its existence. I guess the greater fools theory of investing is stronger than most of us anticipated. the article fails to identify that the initial wells were targeted and drilled on the sweet spots and the remaining locations never had the same potential total output.